Man to Man (Hangul: 맨투맨) is a 2017 South Korean television series starring Park Hae-jin, Park Sung-woong, Kim Min-jung, Chae Jung-an and Yeon Jung-hoon. The show airs on JTBC every Friday and Saturday at 11:00pm KST, starting April 21 to June 10, 2017. 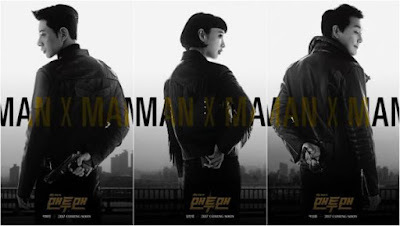 Plot: A longtime celebrity Yeo Woon-gwang (Park Sung-woong) suddenly has a need for a bodyguard and hires Kim Seol-woo (Park Hae-jin), a man trained in special investigations and a mysterious man of many talents. In reality, Seol-woo is a NIS black ops agent who has his own agenda and the role of bodyguard is only a cover to achieve his goals. The drama is about the twisty events they encounter and the budding bromance between the star and bodyguard. In addition, Seol-woo gets romantically involved with Cha Do-ha (Kim Min-jung), the manager of Woon-gwang.